Having access to a fully equipped gym is great, but you can also have amazing workouts from home without having to spend a fortune. Below you’ll find links to our recommendations for building your home gym. Each product is one that we use and believe in. Retail stores charge too much for our liking, which is why we searched hard to find options that are both high quality and affordable so that you don’t over pay or settle for low quality equipment. When muscles get tight, they restrict proper blood flow which is crucial for recovering and building muscle. These tight muscles often develop “trigger points”, hard knots of tissue that cause pain. Foam rolling restores blood and oxygen to the tissue and relaxes tight muscles. A foam roller, A.K.A. “the poor man’s masseuse”, is one of the best recovery tools to invest in for off day recovery, warm ups, and cool downs. Bands are the most versatile, best bang for your buck equipment one could possibly invest in for a home gym. A good set of bands will open up the flood gate in terms of what exercises you’re able to do. Almost any commercial gym exercise can be replicated using bands. Pull downs, rows, chest press, overhead press, curls, pushdowns, squats, lunges, deadlifts, and a hundred more exercises. Not to mention all the rehab, prehab, and corrective drills and stretches enhanced by bands to support healthy joints and good posture. For pressing, rowing, and arm exercises, a band with handles and a door anchor tends to be more suitable. This set of bands come with 5 different loop bands ranging from light to heavy, and 5 mini-loop bands which are awesome for corrective drills and warm ups. Alternatively, this 3 piece set is a little cheaper and would be more than enough to get a beginner started especially if you're needing to start more with prehab/rehab style exercises. The suspension trainer is for everyone, from the Olympic athlete to your sweet ol’ grandmother. If exercises like push-ups, pull ups, squats, lunges, and rows are too challenging in the beginning, the suspension trainer allows you to perform these movements with ease. Conversely, if these exercises have become too easy for you, the suspension trainer can make them more fun and challenging. And therein lies the magic; you can make it as easy or difficult as you need, depending on how you position yourself on the trainer. For an easy push up, walk forward. For a difficult push up, walk backward. If you find it hard to keep your balance in a split squat, hold onto the suspension trainer for support as you squat down. If regular split squats have become easy, try performing them with your floating foot in the foot stirrup and see if it’s still too easy! In gyms you’ll see suspension trainers hanging from the tops of power cages or pull up bars, but home versions come with a door anchor that lets you safely use a sturdy doorway. Having something heavy to pick up off the ground is awesome. 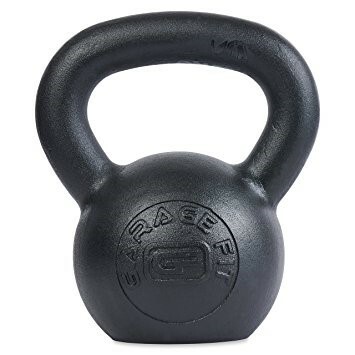 A kettlebell is a cannonball with a suitcase handle, so what’s not to love? Having just one decently heavy kettlebell allows for dynamic movements like cleans, swings, and snatches. Besides burning a lot of calories, these movements improve explosive strength and intermuscular coordination. These are skills which have functional carry over into daily life. Like being able to get out of the way when a car is coming at you. Besides that, kettlebells add load to strength training exercises like rows, squats, deadlifts, and presses. Loading from the front in a goblet position on exercises like squats and lunges is a great way to recruit core and hip engagement. Bottoms-up variations of presses challenge balance and coordination while improving grip strength and rotator cuff activation. Some examples of these are shown below. Now, heavy is a relative term that will be different for each individual. For me, the sweet spot between not too light and not too heavy falls between 40 and 55lbs for dynamic movements like swings and snatches. Always keep an eye out for these at yard sales and websites like Craig’s list. You’ll be surprised at the deals you can find.